Some people often refer to "Africa" as if it is a country rather than a continent. Well, it is a continent and home to 54 independent, unique countries with South Sudan being the latest addition in July 2011. Each country has its own currency, flag, anthem, history, cuisine, music, identity and blend of cultures. In fact more than 2000 languages are spoken in Africa, and its 1 billion inhabitants are made up of over 3000 distinct ethnic groups. 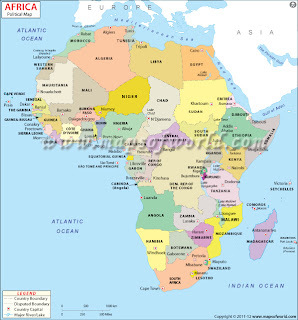 Africa is also bigger than most people think it is, even if they know it covers 30,221 sq km (11, 679 sq miles). If you combine the USA, China, India, Europe and Japan – they all fit into Africa. In fact the USA fits into the African continent three times. Number of Countries in Africa - 54 and a couple of disputed territories (Western Sahara and Somaliland). South Sudan is Africa's newest country, officially born on July 9, 2011. Largest lake in Africa - Lake Victoria in East Africa, bordering Uganda, Kenya and Tanzania. The Lake is the second largest in the world, at 26,560 square miles (68,800 square kilometers). It is the main source of the Nile River. Most populated country in Africa - Nigeria is the most populated country in Africa with an estimated population of 125 - 145 million people. (Population statistics are politically loaded and that's why these numbers vary so much). Egypt is second with over 76 million people. Least populated country - The Seychelles has the lowest population of any country in Africa with around 80,000 people. But Namibia is the least densely populated country in Africa. Most populated city in Africa - Cairo in Egypt is Africa's most populated city with an estimated 17 million residents living in the metropolitan area. Least populated capital city in Africa - Maseru, the capital of the Kingdom of Lesotho has a population of around 14,000. Number of Ethnic Groups (tribes) in Africa - Difficult to estimate but there are at least 3,000 distinct ethnic groups in Africa. A large country like Nigeria has more than 370 recognized tribes. Number of Languages Spoken in Africa - There are over 2000 languages spoken in Africa. Arabic (in various dialects) has the highest number of speakers with over 170 million speakers, mostly living in North Africa and the Horn of Africa. Africa's Capital Cities - There are 52 official African capital cities. Most Visited Country in Africa - Egypt is the most popular tourist destination in Africa. In 2007, Egypt attracted around 10 million visitors. The Pyramids have been a prime tourist attraction for the past 2000 years. South Africa came a close second with 9 million visitors in 2007 (based on figures from UNWTO). Most Visited East African Countries - Kenya and Tanzania are the most popular East African countries for visitors. However, in 2008 Kenya's tourist numbers declined drastically due to political instability. Both countries tend to attract visitors interested in combing a safari with some beach time. Most Visited Country in Southern Africa - South Africa is by far the most popular country in the region. Visitors are attracted to its cities, beaches, wildlife parks as well as niche tourism like bird watching and medical tourism. Mozambique is the fastest emerging tourist destination in the region. Most Visited Countries in West Africa - The Gambia and Senegal attract the most tourists in this region of Africa (which along with Central Africa draws the least amount of tourists on the continent). Both The Gambia and Senegal are popular beach destinations for Europeans fleeing the cold winter weather. Most Visited Countries in North Africa - Egypt is the most popular tourist destination in North Africa, but Morocco has seen the largest growth in its tourism industry (14% in 2007 according to the UNTWO). Tunisia is also extremely popular, particularly with Europeans. When you visit Eritrea's capital Asmara, you can sip a perfect macchiato in an outdoor cafe and enjoy some lovely 1930's, Italian architecture. Lake Malawi is the cheapest place in the world to get your open-water diving certification; enjoy more than 500 varieties of tropical fish while you're learning. The original Star Wars movie sets in the deserts of Tunisia (a.k.a. planet Tatooine) are very well preserved and you can even stay in Luke Skywalker's home. Sudan has more Pyramids than Egypt. The 223 pyramids are smaller and steeper than their Egyptian counter parts, but the Nubians were obviously very busy people around 4 BC - 3 AD. It's possible to take a hot air balloon ride over Luxor and the Valley of the Kings in Egypt. You don't have to be in a safari vehicle to enjoy Africa's wildlife, you can ride alongside wildebeest and zebra on the back of a horse, camel or elephant. Penguins at Boulder Beach in Cape Town, South Africa will literally sit on your beach towel and swim along side you given half a chance. The Ethiopian calendar is 7.5 years behind the Gregorian calendar (which most of you reading probably use). Skiing in Morocco is not just a bad joke, it does actually happen. Affectionately known as "the longest train in the world" the Nouadhibu to Zouerate train in Mauritania is 1.8 miles long (3 km). The trip takes 12 hours, covers about 430 miles (700 km) and passenger cars have finally been added to the freight cars, so you no longer have to sit on the roof or inside the iron ore carriages.